Who are the Brewers getting in Anthony Swarzak? The Milwaukee Brewers are buyers in 2017. If I would’ve told you that on the eve of Opening Day, my readership would be flirting with zero. That’s how incredible this whole thing is. As of publication, the Brewers have a 0.5 game lead in the NL Central over the Chicago Cubs, and they just made a trade. And unlike in recent seasons, they shipped out a prospect (Ryan Cordell) and brought in a veteran (Anthony Swarzak). Yes, the Milwaukee Brewers are buyers in 2017, and even if it’s a soft buy, they’re still attempting to compete. But who exactly are the Brewers getting in Swarzak? This has been a breakout year for Swarzak, and you may have guessed that considering you’ve probably never heard of the guy. At 31 years old, he’s been worth 1.7 WAR and posted a 2.23 ERA and a 2.34 FIP across 48.1 innings of relief this year for the Chicago White Sox. For his career, however, his numbers are intensely different and not nearly has admirable. The truth is that he’s been a bad pitcher for the majority of his career. Yet the Brewers believe the pitcher he’s been in 2017 is the real deal, and they shipped away Cordell — one of the players in the Jonathan Lucroy trade a year ago — to put that belief to the test. The Brewers are probably right about Swarzak, as he’s made significant changes. He’s a two-pitch pitcher who throws a fourseamer and a slider, and he’s managed to up his velocity this year. More importantly, though, he’s discovered a dominant slider. Swarzak has always utilized a slider, but now he’s getting more whiffs than ever with it. 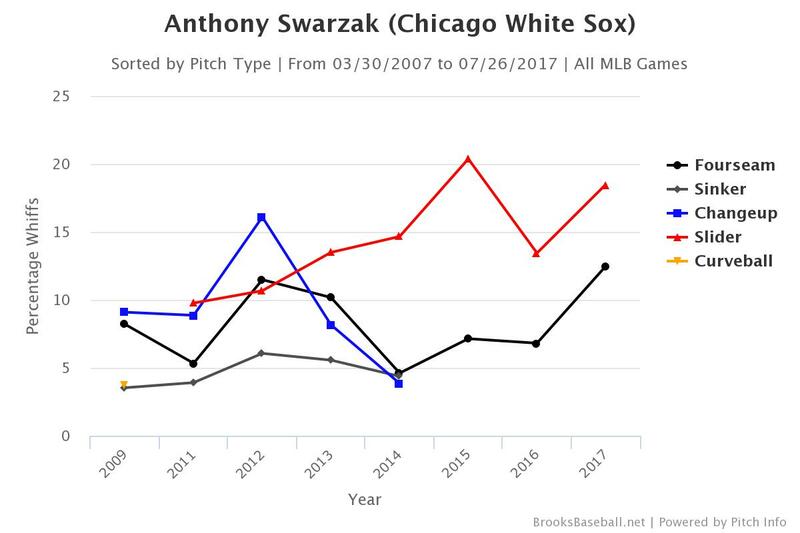 The above chart shows the whiff percentages on each of Swarzak’s pitches since the beginning of his career. As you can see, his slider has gotten better. His slider whiff rate is sitting just under 20 percent (18.48 percent to be exact) in 2017 — the highest of Swarzak’s career. Side note: He pitched just 13 innings in 2015, so I’m throwing away that sample size. Not only has his slider improved, but his fastball has been more fierce as well. It sits in the mid-90s and has jumped up almost a full mile per hour from 2016, and batters are really struggling to hit it, managing just a .168 batting average. Quietly but surely, Swarzak has turned into a reliever that can be trusted down the stretch, not just in games but in the late innings as well. Swarzak will help the Brewers immediately, and this is the type of soft buy the Brewers should be making. Their bullpen is anything but trustworthy, and his presence will allow relievers like Carlos Torres and Oliver Drake to pitch fewer high-leverage innings, which is a very good thing. Swarzak will most likely slide into the seventh/eighth inning role alongside Jacob Barnes, who has had an up-and-down season thus far. Losing Ryan Cordell isn’t easy — I like him more than most — but there’s essentially no risk here on Milwaukee’s side. The Brewers wanted help for 2017, and Swarzak fits that. He’s cheap and reliable; two things David Stearns values. This entry was posted in Trade Talk and tagged Anthony Swarzak, Milwaukee Brewers, Ryan Cordell on July 26, 2017 by Justin Schultz.